Friendship and fabric go hand in hand at Front Porch Quilt Shoppe, a homey haven for quilters in Ozark, Alabama. Located in Ozark, Alabama, Front Porch Quilt Shoppe fills a charming 19th-century home, complete with a wraparound porch perfect for sipping sweet iced tea with mother-daughter owners Melanie and Charley Simpson. Staff and family members pitch in to make samples for Front Porch Quilt Shoppe. Owner Charley Simpson made the hanging banner out of pages from an old book and bright scraps of fabric. Front row, from left: John Simpson, Melanie Simpson (owner), Carol Lattimore, and Charley Simpson (owner); middle row: Janan Doster, Isobel Tierney, Lynn Price, and Marilyn Dean; back row: Aimee Burr, Alisa Danner, Cynthia Farley, and Jackie McKinstry. An array of bright contemporary fabrics is on display in the former parlor at Front Porch Quilt Shoppe. A string of appliquéd onesies embellishes the fireplace mantel. Quilts and baskets of cotton plants grace the shop’s front porch, creating an inviting atmosphere for customers. Owner Charley Simpson creates colorful ornaments using Ficklesticks, flexible fabric wire designed by Diana Taylor. Bright bolts of fabric and samples pack the children’s section at The Front Porch Shoppe. Shop owner Charley Simpson designed a sweet Four-Patch quilt, Sew Charming, for Quilt Sampler® Spring/Summer 2013 magazine. Shop owner Melanie Simpson machine-quilted an allover feather design across the quilt top. 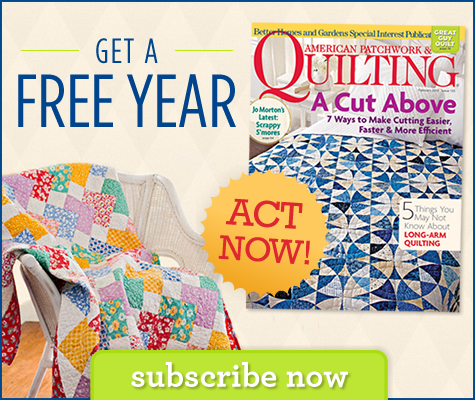 Contact Front Porch Quilt Shoppe  to purchase a copy of Quilt Sampler® Spring/Summer 2013 magazine, pick up the issue at your local quilt shop or newsstand, or get the digital issue online . Peek inside The Noble Quilter , another quilt shop featured in the Spring/Summer 2013 issue.